I ordered a caesar salad for lunch one day and it was spicy, not chili spicy but it had some sort of heat to it. I asked the waiter what was in the dressing and he said horseradish. What I great idea, so I went to the store and picked up a bottle of horseradish and made the salad again while the flavours were still fresh in my mind. I however wanted to play up the sharpness of the dressing with the vegetables, so added radishes and onions. I used parsley like lettuce with the romaine and radicchio instead if as its usual garnish. I also wanted to make it a meal, which typically includes a grilled piece of chicken, and caesars always have croutons. I put those two ingredients together and made chicken croutons. I have to admit, this was better than the one I had in the restaurant. Cut chicken breasts into cubes the size of large croutons. Set up your breading station. Fill one Ziploc bag (I like using the portion ones) with coconut flour and 1/2 teaspoon of salt and pepper. In a shallow bowl, beat the egg with the Tabasco sauce. In another bag, add the almond flour, parmesan, 1/2 teaspoon salt and pepper, paprika, and oregano. Put all the chicken in the coconut flour bag and shake till coated. Take the chicken and coat it in the egg mixture and put it in the almond flour bag and shake till coated. In a frying pan on medium heat, pour oil to cover the bottom of the pan. Place breaded chicken in the pan and fry for about 7 minutes until golden brown. Remove from the oil and place on a plate lined with paper towel. In a large bowl, add the lettuces, onions, radishes, and parsley. Toss. In a small bowl mix the dressing with the horseradish and lemon juice. Add to the salad and toss till the leaves are coated. 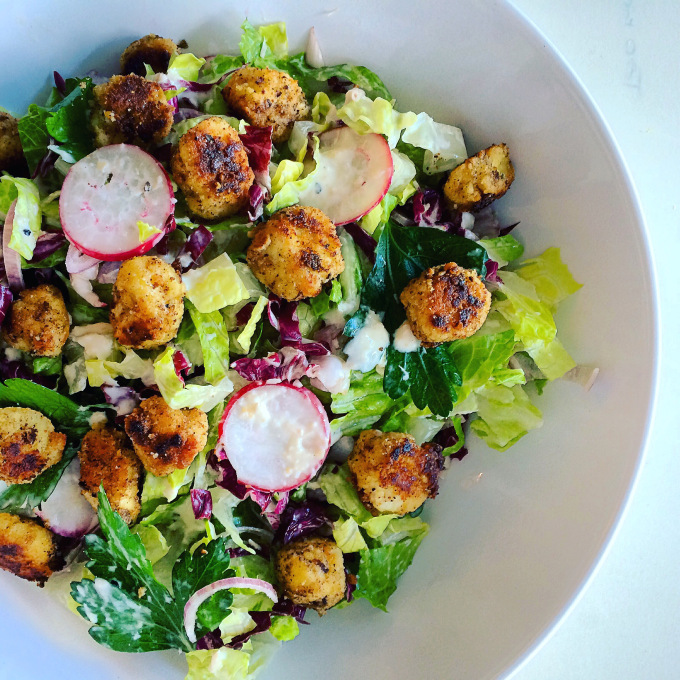 Plate the salad and top with the chicken croutons. I know the Caesar dressing is not homemade, but it doesn’t have to be. I could make my own, but I really like the Renee’s dressing so I doctored it up. You can make your own Caesar dressing or use your favourite. The key ingredient here is the horseradish.